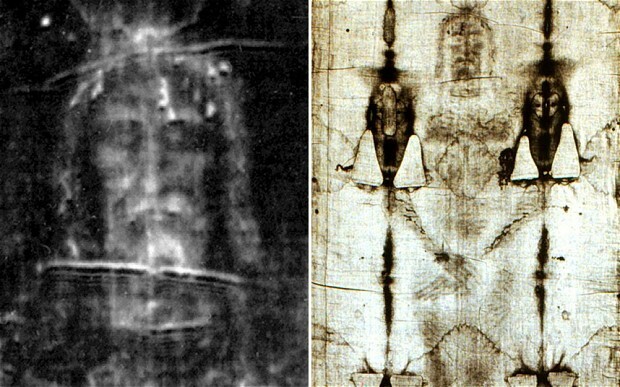 The Turin Shroud is not a medieval forgery, as has long been claimed, but could in fact date from the time of Christ’s death, a new book claims.
. . . Scientists, including Prof Fanti, used infra-red light and spectroscopy – the measurement of radiation intensity through wavelengths – to analyse fibres from the shroud, which is kept in a special climate-controlled case in Turin. The tests dated the age of the shroud to between 300 BC and 400AD.
. . . He said his tests backed up earlier results which claimed to have found on the shroud traces of dust and pollen which could only have come from the Holy Land. First, I have my doubts about the accuracy of the dating technique, and the 700 year time span seems too large to be helpful. Second, even if the material were dated to the time of Jesus and was found to contain pollen from Judea, etc., it does not follow that an image of a man was not transferred onto the cloth at some later time. Third, I suspect the Shroud is some kind of forgery but if it were not, I do not think the kind of evidence to prove it so exists. By the way, does anyone know whether or not linen cloths hold up like this for 2000 years? For more on the Shroud from a (more) sympathetic point of view, try this piece from Simon J. Joseph. I have read of one burial shroud found in Palestine and probably from about the relevant time. It was made with a simple two-way weave – not the twill weave used on the Turin Shroud, which textile experts say was introduced more than 1,000 years after Christ lived. As for dating the shroud by testing fibres mechanically, that’s news to me. I’d like to know what evidence there is for accuracy of this method after more than a thousand years, and whether it is influenced by humidity or whether the fibres have been carefully stored for centuries or recently removed from the ground. According to Wikipedia the twill isn’t inconsistent with the 1st century. Just saying.